Towards the end of its first act, and for parts of its second, My Paris hits the gong. 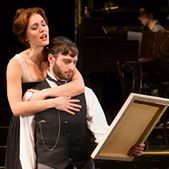 The fairly new musical at Long Wharf Theater (it had a prior workshop at Goodspeed's Norma Terris Theater) is an on-again, off-again story of Henri de Toulouse-Lautrec, the celebrated Belle Epoque artist who, as participant and observer, made the Moulin Rouge famous, and vice versa. The setting is colorful, but My Paris doesn't seem to know what it wants to be or where it wants to go, beyond revolving around the diminutive artist-aristocrat and his talent for depicting the demimonde in the City of Light. Before plunging into that whirl, however, the show (Alfred Uhry's book, the legendary Charles Aznavour's music and lyrics, the latter simplistically adapted from the French by Jason Robert Brown), delves into his childhood. Papa, a macho type, expresses his disappointment in fathering a deformed son, one with whom he cannot go hunting. Maman, on the other hand, protects Henri, going so far to follow him, when he becomes a young man, to Paris. There he enrolls in an art class run by Léon Bonnat, depicted as the usual effeminate, predatory artist, a stereotype always good for a cheap laugh. Henri's fellow students at first tease, then show their liking (or is it their exploitation? ), taking him on the town where he's introduced not only to the Moulin Rouge but the deadly drink, absinthe. The liqueur is personified by the Green Fairy, a female wraith bathed in green light who literally wafts over the scene (with the help of the stalwart ensemble). It's at the club, of course, that Henri gains favor and turns out famous advertising posters featuring Jane Avril, Aristide Bruant, La Goulue, Yvette Guilbert, etc. The second half is less flamboyant but more dramatically cogent. An argument between father and son is followed by one with Maman in which she expresses her frustration with her son's choices. She's especially shocked that he's shacking up with a woman, Suzanne Valadon, played with the right air of mystery and allure by Mara Davi. What's it all about then? Is this a generational clash? A prodigal son story? An insight into the creative process? A riff on the price of friendship? A warning about misplaced love? Uhry's diffuse book glances at ideas without really developing any one in particular. So we're left with rehashing a familiar story (filmed well in 1952 by John Huston, busily in 2001 by Baz Luhrmann), one that ends up shallow and unsatisfying. We get the drinking and the dissolution, but not the pain. Luckily, we get the superb Bobby Steggert as Henri, tracing the character's every disappointment in himself: his stature, his looks, his need to drown himself in the drink that kills him at age 36. We also get, as Papa, the terrific Tom Hewitt, enlivening the show every time he appears and, as Maman, the sympathetic Donna English. The ensemble women dance a cheerful can-can, underpants to the fore, and the cast, in general, is accomplished. There's even a tiny puppet to represent Henri as a child, a clever touch. Credit the handling of that scene to director Kathleen Marshall, even though her work elsewhere is routine. She's tops in the choreographic department, however. And the show, although cramped on the Long Wharf stage looks good, thanks to Derek McLane's set, Donald Holder's lights, Paul Tazewell's costumes and Olivia Sebesky's projections. There's hope here: My Paris is not a disaster. But, right now, it's in need of a point of view to clarify what story it wants to tell. There's no substitute for substance.